RBTH presents a selection of views from leading Russian media on international events, featuring reports on the latest round of talks between negotiators on resolving the conflict in eastern Ukraine, amendments to the law that will bring new benefits for social NGOs, and the problems facing Ukrainian citizens in Russia who have fled the war in the Donbass. 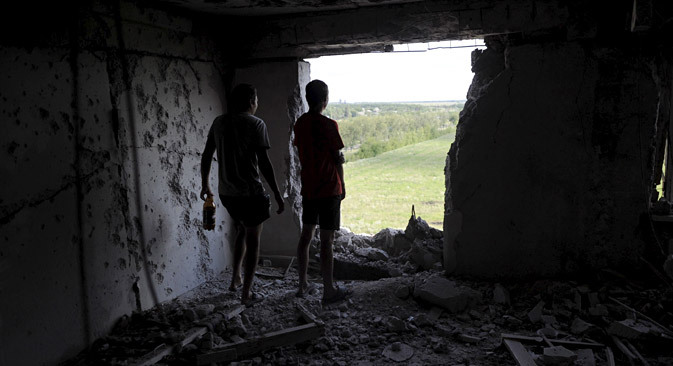 The Kommersant business daily reports that international mediators have made new efforts to resolve the conflict in the Donbass region of eastern Ukraine within the terms of the agreement reached in Minsk in February. In their first telephone conversation since late April, the leaders of the four negotiating parties (Russia, France, Germany and Ukraine) urged the sides to the conflict to implement the agreed peace plan by the end of the year. The surge in diplomatic activity over Ukraine comes against the backdrop of the historic nuclear deal reached on Iran, which has become a rare example of constructive cooperation between Russia and the West, writes the paper. In addition, ahead of the talks, Ukraine’s parliament, the Verkhovna Rada, approved draft constitutional amendments on decentralization of power proposed by Ukrainian President Petro Poroshenko and lobbied by the West and submitted them to the country’s Constitutional Court for assessment. This time, Moscow did not meet Kiev’s new initiative with fierce criticism, though it condemned “what amounts to a blockade” of the parts of Donbass controlled by the self-proclaimed Donetsk and Lugansk “people’s republics” (DNR and LNR). During the talks, German Chancellor Angela Merkel and French President François Hollande welcomed the fact that the Ukrainian parliament had adopted the constitutional amendments, describing it as a new phase in implementing the political part of the Minsk accords. “Having put pressure on Kiev, the West expects similar actions from Moscow in relation to the DNR and LNR. In this situation, Russia can, if not win in this game, then at least bring it to a draw, leaving Crimea out of the equation,” said Gushchin. The Vedomosti business daily reports that this week the Russian Public Chamber will be discussing amendments to the law on non-commercial organizations in order to clarify state support for socially-oriented NGOs. The amendments will make it possible to equate socially-oriented NGOs with small and medium-sized businesses in terms of the state support opportunities open to them, in particular guarantees for attracting loans and interest-rate subsidy options, the head of the Russian Economic Development Ministry’s department of social development and innovations, Artyom Shadrin, told Vedomosti. Specialized funds that provide support to small businesses, having received additional assistance from the budget, will be able to help NGOs too. The law is expected to come into force in 2016. The centrist newspaper Nezavisimaya Gazeta reports, citing the Federal Migration Service, that some 900,000 Ukrainian citizens would like to remain in Russia. However, many of those who have sought shelter in Russia are encountering various problems: For example, they are increasingly being refused medical help because they do not have medical insurance. There are over a million Ukrainian citizens in Russia at the moment who have fled the fighting in the Donbass, according to the newspaper. According to the head of the migration policy commission under the presidential human rights council, Yevgeny Bobrov, after long delays and red tape, a considerable number of Ukrainians manage to secure residential or other status in Russia. However, this cannot be said for Ukrainian nationals’ applications for Russian citizenship: According to Bobrov, citizenship has so far been granted to just one in five of the 100,000 or so applicants. The recommendations that the presidential human rights council has issued for the authorities have been largely ignored: At the moment, Bobrov said, most Ukrainian citizens who have fled the conflict are living without information or social support from the state and their legal status is little different from that of labor migrants from Central Asia. Currently most have to manage by themselves. “Only a small fraction of them are staying in temporary accommodation centers and are receiving benefits from the state. Some are staying with Russians, whose requests to receive some compensation for this assistance have even been rejected,” said Bobrov.